PSP doesn’t sell a million. Sony to invent the Matrix. New versions of Katamari Damacy, Fable, Halo, and Project Gotham heading your way. Xbox 2 unveiled before E3? GameTalk: Will the PSP make it? SporeTalk: Juicy inside information on Spore. 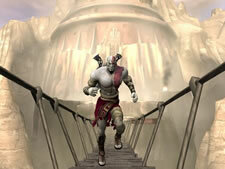 In-depth review of God of War for the PS2. Plus some more random thoughts. Get the podcast from this page (63 minutes): Gaming Steve Episode 7.